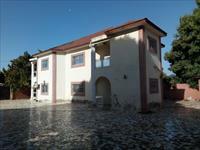 A magnificent, good quality house located in Lamin Village in the Gambia available for sale. It is fully air condition and has a two living rooms.This property provides a unique potential as a private home. lt is 150 meters from the main Highway. Good road network, peaceful, quiet and secure location.